A piece of my mind. 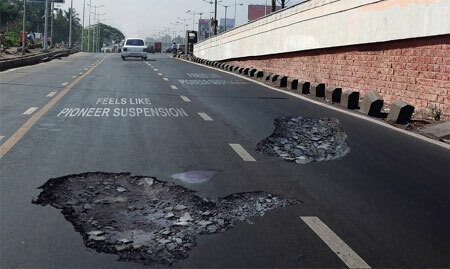 : Get ya breaks on! 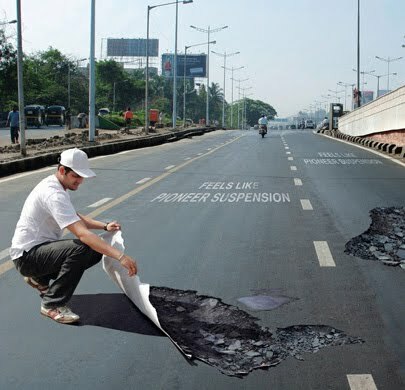 This ambient stunt was created by Y&R Everest to promote Pioneer Suspension in India. Although from 2007, it is still being circulated around emails as a 'Canadian Speed Control Device'. Drivers approaching the pothole expect to get bumped around and even try to avoid the hole, but actually driving over it is a very smooth ride. This is a great demonstration of a publicity stunt that has stood the test of time and caused lots of discussion. People are suggesting that it was a fake due to the dangerous nature of placing a hazard in the road. Fake or not... it's very clever!